ADSelfService Plus supports Active Directory (AD)-based single sign-on (SSO) for Base CRM and many other SAML-enabled applications. 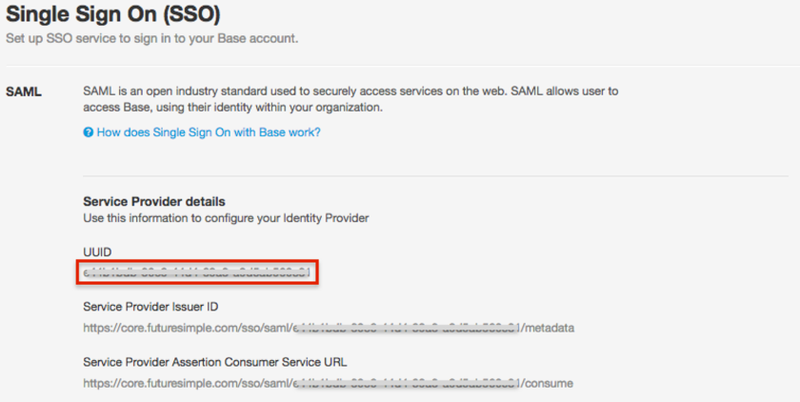 When SSO is enabled for Base CRM, users only have to login once into ADSelfService Plus - the identity provider. After logging in, users can securely access their Base CRM account without having to enter their username and password again. ADSelfService Plus supports both Identity Provider (IdP) and Service Provider (SP)-initiated SSO for Base CRM. IdP-initiated SSO for Base CRM: Users need to log in to the ADSelfService Plus self-service portal first, and then click on the Base CRM icon on the Applications dashboard to access Base CRM. SP-initiated SSO for Base CRM: Users can access their Base CRM domain via a URL or bookmark. They will automatically be redirected to the ADSelfService Plus portal for login. Once they've signed on, they'll be automatically redirected and logged into the Base CRM portal. Download and install ADSelfService Plus if you haven’t already. With ADSelfService Plus, you can use the existing AD domain credentials of users for authentication during SSO. So, first you need to configure an AD domain in ADSelfService Plus to enable SSO for Base CRM. ADSelfService Plus will try to automatically add all the domains that it can discover in your network. If your domains are automatically added, skip to step 9; otherwise, follow Steps 1-8 to add them manually. Launch the ADSelfService Plus web console and log in using admin credentials. Click the Domain Settings link available on the top-right corner of the application. An Add Domain Details window will appear. In the Domain Name field, enter the name of the domain you want to add. In the Add Domain Controllers field, click Discover. ADSelfService Plus will try to automatically discover the domain controllers associated with the domain. If the domains are not auto-discovered, then enter the domain controller name in the field provided, and click Add. You can leave the authentication fields empty if you're not going to use the end user self-service features of ADSelfService Plus. Back in the Add Domain Details window, click Add to complete adding the domain in ADSelfService Plus. Getting the SAML details from ADSelfService Plus. Navigate to Configuration → Self-service → Password Sync/Single Sign On. Click Base CRM in the list of applications provided. Click Download SSO Certificate in the top-right corner of the screen. In the pop-up that appears, copy the Login URL and the SHA1 FingerPrint. Configuring SSO settings in Base CRM. Log in to Base CRM with administrator credentials. Navigate to Account → Settings → Single Sign On. In the window that opens, copy the UUID value. In the Identity Provider Issuer ID and the Identity Provider SSO URL fields, enter the Login URL value from step 12. In the Identity Provider certificate fingerprint field, enter the SHA1 FingerPrint value from step 12. Adding your Base CRM domain in ADSelfService Plus and enabling SSO. Now, switch to ADSelfService Plus’ Base CRM configuration page. In the Domain Name field, enter the domain name for which you just enabled SSO. In the Display Name field, provide an appropriate display name. In the UUID field, enter the UUID value from step 16. In the Available Policies field, click the drop-down box and select the policies for which you wish to enable SSO. The policy you select will determine which users have the SSO feature enabled. Note: ADSelfService Plus allows you to create OU and group-based policies for your AD domains. To create a policy, go to Configuration → Self-Service → Policy Configuration → Add New Policy. Click Select OUs/Groups, and make the selection based on your requirements. You need to select at least one self-service feature. Finally, click Save Policy. Your users can now log into their Base CRM accounts automatically using single sign-on. Yes I'm Interested No, I'd rather pay more.